A forum member wants to know how to create shape outlines using Photoshop Elements. BoulderBum writes: "I'm aware of the shape tool, but all I can get it to create is a solid shape. There has to be a way to draw only the outline of a shape! After all, the outline appears when the shape is selected... Is it possible?" We're happy to say that it is possible, although the procedure is not at all obvious! To start, let's understand the nature of shapes in Photoshop Elements. In Photoshop Elements, shapes are vector graphics, which means these objects are made up of lines and curves. Those objects may consist of lines, curves, and shapes with editable attributes such as color, fill, and outline. Changing the attributes of a vector object does not affect the object itself. You can freely change any number of object attributes without destroying the basic object. An object can be modified not only by changing its attributes, but also by shaping and transforming it using nodes and control handles. These vector graphics are resolution-independent – that is, they can be scaled to any size and printed at any resolution without losing detail or clarity. You can move, resize, or change them without losing the quality of the graphic. 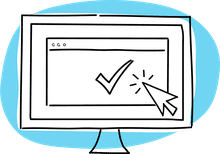 Because computer monitors display images on a pixel grid, vector data is displayed on-screen as pixels. In Photoshop Elements, shapes are created in shape layers. A shape layer can contain a single shape or multiple shapes, depending on the shape area option you select. You can choose to have more than one shape in a layer. In the options bar, choose a custom shape from the shape palette. In this example, we're using 'Butterfly 2' from the default shapes in Elements 2.0. Click next to Style to bring up the styles palette. Click the small arrow in the top right corner of the styles palette. Choose visibility from the menu, and pick the hide style from the styles palette. Click in your document window and drag out a shape. The shape has an outline, but this is just a path indicator, not a real outline made of pixels. We're going to convert this path to a selection, then stroke it. Make sure your layers palette is visible ( select Window > Layers if it's not), then Ctrl-Click (Mac users Cmd-Click) on the shape layer. Now the path outline will start to sparkle. That's because the selection marque is overlapping the path so it looks a little strange. Click the new layer button on the layers palette. The selection marquee will look normal now. Go to Edit > Stroke. In the stroke dialog, choose a width, color, and location for the outline. In this example, we've chosen 2 pixels, bright yellow, and center. You may delete the shape layer now – it's no longer needed. Draw the Butterfly Shape and fill it with Black. Draw out your shape and click once on the Shape layer. Click Simplify which turns the shape into a vector object. Select Edit > Stroke (Outline) Selection. When the Stroke panel opens choose a stroke color and a stroke width. Click OK. 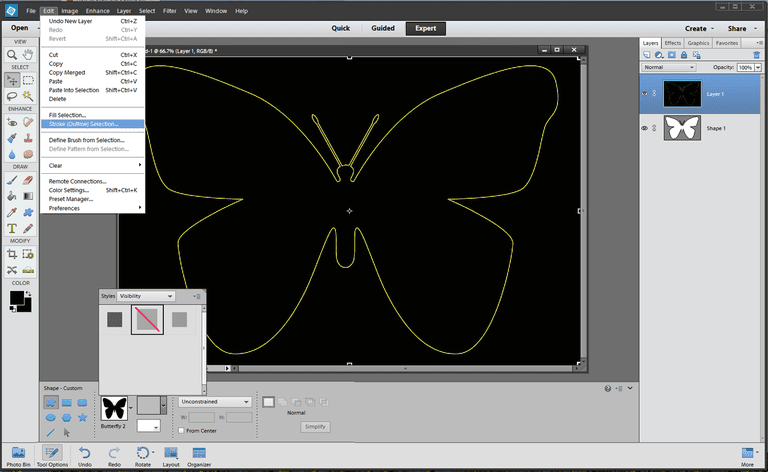 Your butterfly is now sporting an outline. Switch to the Quick Selection tool and click and drag through the Fill color. Press Delete and you have an outline. The outlined shape is on its own layer so you can move it independently. The outlined shape is not a vector object so it can't be scaled without some loss in quality. Explore the other shapes styles that come with Elements from the menu.